Earlier today, vast parts of the South and Midwest were hit by vicious tornados that leveled entire towns. The storm started in Alabama in the morning; by the end of the afternoon giant funnel clouds were touching down in Indiana and Ohio. It's already reportedly wiped one town entirely off the map. Most people were smartly hunkering down trying to stay safe but some crazy individuals went outside to capture pics with their phones. These are some of the striking amateur images captured today. We shouldn't even have to say this, but don't be one of these people. 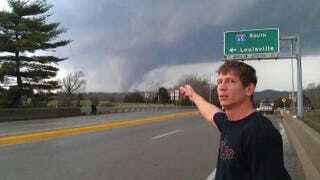 Tornadoes are deadly, unpredictable forces of nature, and no Twitpic is worth risking your life. Top image: Tornado spotting in Kentucky. Late Afternoon in Borden, Indiana. Borden, Indiana around 3:45 p.m.